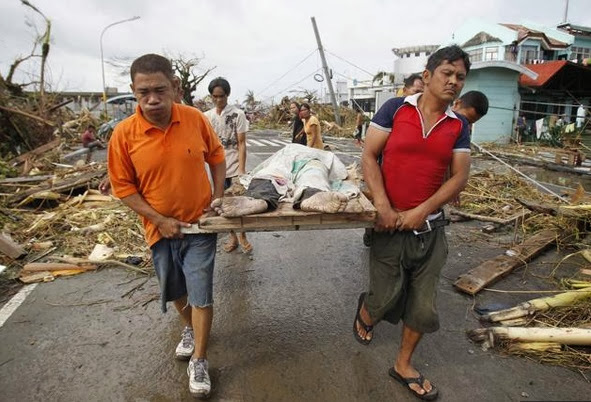 Manila, Philippines - Super Typhoon 'Yolanda/Haiyan' devastated several regions in the country with 10,000 feared dead in Leyte alone, regional police chief said on Sunday, November 10, 2013. However, Natural Disaster Risk Reduction and Management Council (NDRRMC) official report for the death toll in Leyte is around 118. NDRRMC Spokesperson Reynaldo Balido Jr. said that nationwide death toll of Typhoon Yolanda now stands at 151 with most of the victims were from Eastern Visayas, particularly in Tacloban and Palo in Leyte, and from Eastern Samar. The following are based on current available data from the Natural Disaster Risk Reduction and Management Council (NDRRMC) as of November 10, 2013 (6:00 a.m.). LAGUNA: 948 families in 36 barangays were affected, 50 evacuation centers with 950 families, 2 houses partially damaged. Power outages are experienced in Pangil, Cavinti, Victoria, Rizal, and Mabitac. PALAWAN: 4 dead, 10 passengers and 1 motorbanca are stranded in Puerto Pricesa. Power outage are experienced in Coron, Roxas, Busuanga, Magsaysay, and Cuyo. MARINDUQUE: 981 families in 46 barangays were affected, 1,309 families in 69 evacuation centers. Power outage is experienced province wide. OCC. MINDORO: 1,679 families in 12 barangays were affected, 7 evacuation centers with 954 families. Power outage are experienced in San Jose, Magsaysay, Rizal, Calintaan. ORI. MINDORO: 3,117 families in 73 barangays were affected, 106 evacuation centers with 3,117 families, a portion of Calapan north road are not pasable to light vehicles due to a landslide. P761,062.50 worth of damages to agriculture. Power outage are experienced in Naujan, Calapan City, Pinamalayan, Bulalacao, Victoria, and Bansud. ROMBLON: 3,044 families in 72 barangays were affected, 100 evacuation centers with 3,044 families, Php979,765.00 worth of assistance from LGUs. Power outage is being experienced. MASBATE: 1 dead, 969 families in 21 barangays were affected, 24 evacuation centers with 969 families, P1.388M worth of assistance from DSWD. Power outage is being experienced. CAMARINES SUR: 7 injured, 17,232 families in 126 barangays were affected, 147 evacuation centers with 4,277 families, Lagonoy Presentation road not passable due to landslide, Portions of Maligaya Road, road in Brgy Cabotonan, Brgy Panicuan, and Brgy Patrocinio are not passable, P765,055.00 worth of assistance from DSWD. Power outage is being experienced. ALBAY: 15,143 families in 101 barangays were affected, 92 evacuation centers with 13,730 families, 420 passengers and 3 vessels are stranded, P1.350M worth of assistance from DSWD. Power outage is being experienced. CATANDUANES: 312 families in 1 barangay were affected, 1 evacuation center with 312 families, a portion of road in Brgy Lubas San Andres, and Brgy Bagong Sirang are not passable due to uprooted trees. Power outage is being experienced. ILOILO: 1 dead, 6 injured, 1 missing, 30,550 families in 315 barangays were affected, 70 evacuation centers with 3,420 families, 11 houses totally damagaed, 18 houses partially damaged, Iloilo-Antique road from Belison to Pandan is not passable due to uprooted trees. P900,674.00 worth of assistance from DSWD. Power outage is being experienced. AKLAN: 1 dead, 5,572 families in 89 barangays were affected, 12 evacuation centers with 655 families, 2,037 houses totally damaged, 1,357 houses partially damaged, P522,000.00 worth of assistance from DSWD. Power outage is being experienced. Cellular networks are down. ANTIQUE: 2,791 families in 65 barangays were affected, 60 evacuation centers with 2,038 families, P203,490.00 worth of assistance from DSWD. Power outage is being experienced. Cellular networks are down. CAPIZ: 6 dead, 8 injured, 2,337 families in 17 barangays were affected, 7 evacuation centers with 155 families, P326,250.00 worth of assistance from DSWD, P1,000.00 from LGU. Power outage is being experienced. Cellular networks are down. NEGROS OCC. : 14,291 families in 120 barangays were affected, 61 evacuation centers with 8,628 families, Portions of Bacolod Southroad are not passable due to landslide. P547,056.00 worth of assistance from DSWD. Power outage is being experienced. CEBU: 1 injured, 2 missing, 565,706 families in 82 barangays were affected, 121 evacuation centers with 9,629 families. P507,755.00 worth of assistance from DSWD. Power outage is being experienced in 24 municipalities. Cellular networks are down. BOHOL: 128,264 families in 133 barangays were affected, 177 evacuation centers with 6,393 families. P474,850.00 worth of assistance from DSWD. Power outage is being experienced. LEYTE: 118 dead, 420 families in 2 barangays were affected, 1 evacuation center with 76 families, Ormoc-baybay road, and Palo-Carigara-Ormoc rd, and Libungao-matag-ob-palompon rd., and Palompon-isabel-merida-ormoc rd. not passable also due to fallen trees and electrical posts, San Juanico bridge is not passable. Power outage is being experienced. Cellular networks are down. EASTERN SAMAR: 16 dead. Power outage is being experienced. Cellular networks are down. 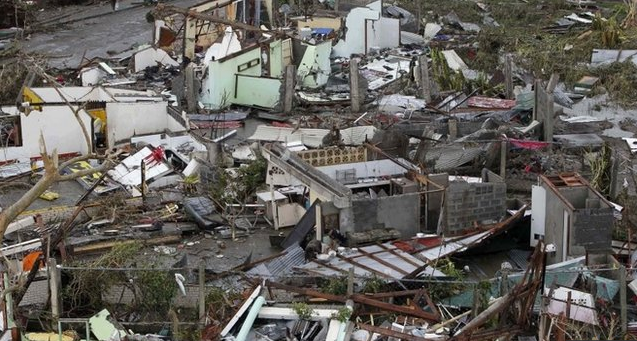 N. SAMAR: 3,799 families in 10 barangays were affected. Power outage is being experienced. Cellular networks are down. SAMAR (W.SAMAR): 2,243 families in 3 barangays were affected, 10 evacuation centers with 2,243 families, San Juanico bridge is not passable, 71 passengers and 67 rolling cargoes are stranded in Catbalogan. Power outage is being experienced. Cellular networks are down. S. LEYTE: 4,173 families in 11 barangays were affected, 61 evacuation centers with 3,224 families, Mahaplag-Sogod road and Daang Maharlika Libagon Section are not passable due to uprooted trees. Power outage is being experienced. Cellular networks are down. BILIRAN: Power outage is being experienced. Cellular networks are down. AGUSAN DEL NORTE: 640 families in 17 barangays were affected. AGUSAN DEL SUR: 33 families in 8 barangays were affected. Power outage is being experienced. DINAGAT ISLANDS: 1,202 families in 37 barangays were affected, 5 evacuation centers with 288 families. P4.88M worth of damages to infrastructure and P2.335M worth of damages to agriculture. Power outage is being experienced. SURIGAO DEL NORTE: 4,278 families in 78 barangays were affected. Power outage is being experienced. Cellular networks are down.